Our Wednesday pilot Village Senior Van Service is changing because we have found the service to be used less than expected. The service will be available the first and third Wednesdays of February, March and April (February 7 and 21, March 7 and 21, April 4 and 18). Tuesday and Thursday service has not changed. The Wednesday van will depart Ridgewood at approximately 10 am. Please call Beth Spinato at 201-670-5500 x203 to arrange transportation to Interstate Shopping Center on these Wednesdays. Age Friendly Ridgewood will re-evaluate this pilot at the end of April and if ridership has increased we will consider future funding. 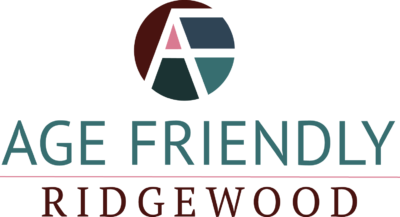 A listing of businesses that took the time to meet with Age Friendly Ridgewood and learn about business practices that are good for baby boomers and older citizens. The Community Center of Ridgewood Foundation Inc. Photos of Ridgewood are courtesy of Geraldine Abdoo.